Mechan Controls is a leading British designer and manufacturer of safety systems, specializing in the production of contactless safety switches. Mechan Controls is active worldwide and produces contactless safety switches that are particularly suitable for environments where cleaning is done under high pressure or environments where a normal switch breaks quickly, such as in bulk industry. Safety switches that have proven their strength in the toughest and most demanding environments of the industry. Non-contact safety switches are seen as one way to improve safety, but also performance and productivity. 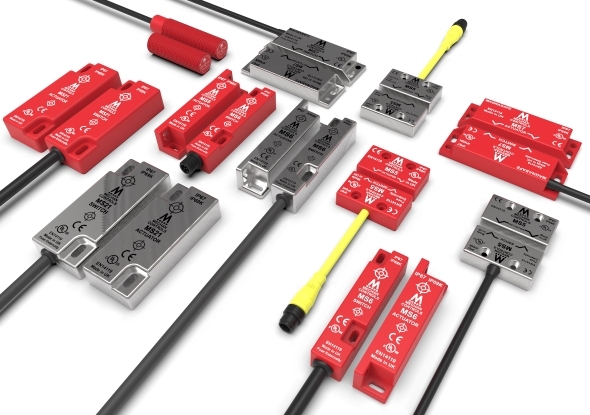 The growing demands for reliability and efficiency in the modern production environments have led to a large increase of non-contact safety switches. 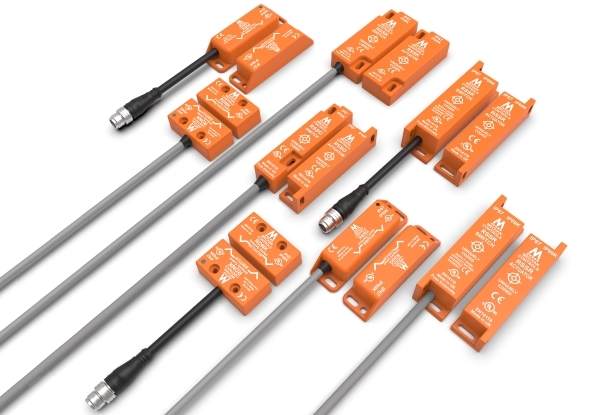 Unlike other RFID switches on the market that use OSSD, the Mechan Controls RSS-series, made of ABS, Resin filled, is unique because it uses volt-free contacts. So you are not tied to a specific one brand, but you are free in your choise of safety relay. They are individually coded for high security applications providing a simple reliable solution to machine guard interlocking. The RSS series offers additional security by using 4,000,000,000 unique codes up to safety category 4, according to the safety standard EN 14119 and have a seal of IP67 and IP69K for use in humid or dusty environments. The switch is equiped with a LED guard indicator. Read more about Mechan Controls RSS series. The magnetic safety switch Mechan Controls Magnasafe is a magnetically operated safety switch. The Magnasafe switches are fully encapsulated with resin, which makes the switch extra sturdy and resistant to vibrations. 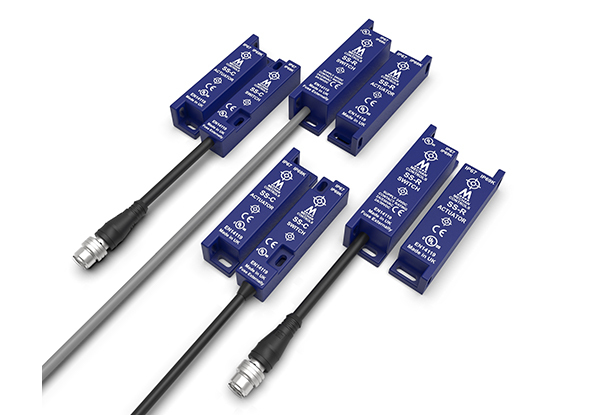 The switches are ideal for use in rough and / or humid environments. Read more about Mechan Control's magenetic safety switches. The Mechan Controls HE-Series is a Solid State coded magnetic switch and has safety level Cat 4, SIL 3 and PL e. The switch works well up to -30 °C. The enclosure is fully encapsulated with resin, which makes the switches resistant to vibration, high pressure cleaning and most difficult environments. The magnetic switch is also available in 316 stainless steel and suitable for use in the food processing and packaging industry. 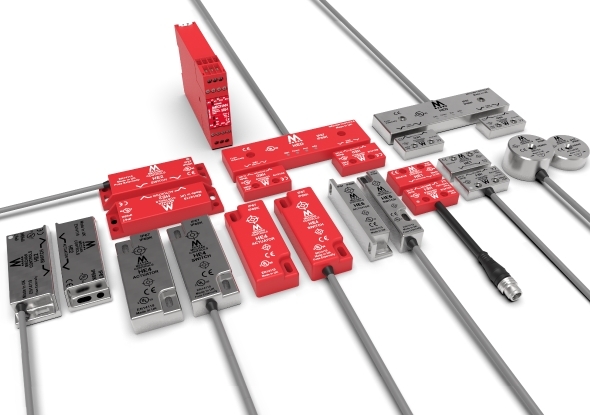 Read more about coded magnetic safety switches. Mechan Controls S-Type is an electronic safety switch that operates on the basis of Mechan's unique frequency control. The S-Type safety switches are safe, standalone, contactless safety switches with status display. "Simple to install stand-alone, tamper-proof, non-contact safety switches"
The precise operation and switching ensures a reliable safety system. The S-Type safety switches are available in two sizes with up to 2 NO safety contacts and 1 NC auxiliary contact. Read more about electronic safety switches.